The weather outside is frightful, so coffee with friends would be so delightful! Catching up with your friends over a yummy warm beverage is perfect for this time of year. Continue reading our Look of the Week to find a hot outfit that will go along with that hot cup of coffee! What makes this combination of items perfect for coffee with friends? Coffee with friends is the time to discuss books, films, life goals, big dreams and all the other fun things you want to chat about! This combo showed my personality. I added the multiple cuffs and the heavy scarf because I always get cold. My favorite item is the scarf! I love the subtle tribal pattern, and it is so soft and snuggly! It’s the perfect item to take with you when you’re going out in the cold. Are you a coffee fiend or do you prefer something less caffeinated to get your day started? I love coffee, but I don’t drink a lot of it and I certainly don’t HAVE to have it every day. To me, it’s more of a situational thing, so coffee with friends works for me. What’s your favorite holiday coffee beverage and why? I love caramel macchiato or a classic hot chocolate. Oh, and add a candy cane and I’m good to go! My girls and I love handbags, so I like to bring the ones that really stand out. Since it’s cooler outside, a cute and warm scarf can add to any look. 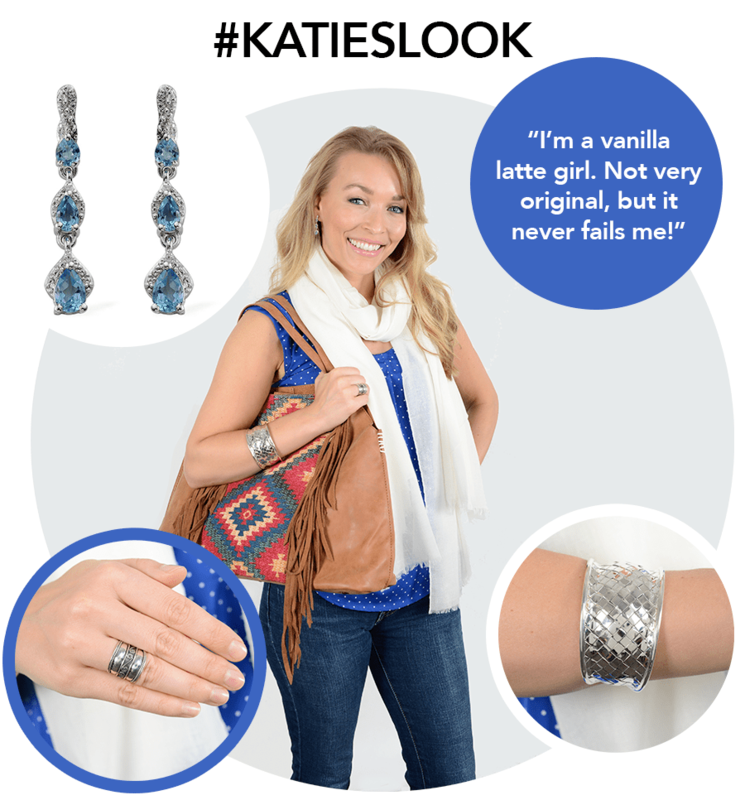 With the season changing, I love adding silver jewelry to my outfits for a cool but bold touch. I love this bag! The fringe is on trend and the Aztec pattern is colorful and eye-catching. I love coffee! When it’s cooler outside, my friends and I can spend hours in a coffee shop chatting and sipping our drinks. I’m a vanilla latte girl. Not very original, but it never fails me. The best part about the Look of the Week is that you can get all of these featured items right here at the LC! Now that you have TWO wonderful options for a chatty coffee date with friends, use the hashtags #KATIESLOOK and #KELSEYSLOOK on Twitter and Facebook to cast your vote! Which look would you wear?